The purpose of human life is to worship Supreme God Kabir and return back to our original abode, Satlok (Sachkhand, eternal place). 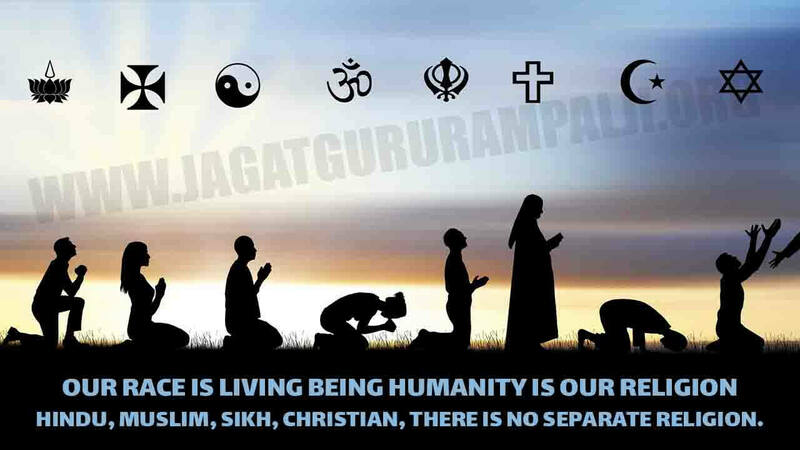 Anyone and everyone wanting to worship Supreme God Kabir can take naam (initiation) from Spiritual Leader Jagat Guru Rampal Ji Maharaj irrespective of their cast, creed, colour, faith or religion as God created every human equal. Anyone interested in taking naam can contact us on 08222880541 - 545. There are various naam daan centres in India, and there are a few abroad as well. You can get the information about your nearest naam daan centres from the number given above. You can then visit the naam daan centre and take naam. Please make sure you are willing to follow the below mentioned rules as these are imperative for bhakti to be successful and productive. Without following these rules one cannot derive the benefits of true bhakti. Please take time to go through these rules in detail. Those who are aspiring to take initiation have to abide by the following rules. It is imperative to follow these boundaries of worship. If someone commits any mistake unknowingly, it is forgiven, but if someone knowingly commits a mistake, then that devotee becomes devoid of naam and bhakti. The only solution then is to ask for forgiveness from Gurudev and receive initiation again. Today in Kalyug (There are four Yugas. 1. Satyug 2. Tretayug 3. Dwaparyug 4. Kalyug. The present Yug is Kalyug.) the most difficult question before the devotee community is to identify a Complete Guru. But its answer is very short and simple, that a guru who does worship (bhakti) according to the scriptures and makes his followers i.e disciples do it, only he is a Complete Saint. Because religious scriptures like - speech of Kabir Sahib, speech of Shri Nanak Sahib Ji, speech of Sant Garibdas Ji Maharaj, speech of Sant Dharmdas Ji Sahib, Vedas, Gita, Puran, Quran, Holy Bible etc are the constitution of the path of Bhakti. Whichever saint tells way of worship and shows the path to the devotee community according to the scriptures, he is a Complete Saint; otherwise he is a big enemy of the devotee community who is making others do worship opposite to the scriptures. He is playing with this invaluable human life. Such a guru or saint will be hung upside-down in deep hell in God's court. For example, if a teacher teaches from outside the syllabus, then he is an enemy of those students. Translation: Those whose knowledge has been stolen away by Maya, such men who have demoniac nature, who are lowest among men, the evil-doers, fools, do not worship me i.e. they keep doing sadhna of the three gunas (Rajgun-Brahma, Satgun-Vishnu, Tamgun-Shiv). Translation: - About the God, normally say that He is formless i.e. who never takes birth. Others say that He is in form i.e. takes birth in the form of an incarnation. Those who, endowed with durable i.e. complete knowledge, narrate properly, in this way they only properly i.e. in true way give His clear and distinct knowledge. Translation: Understand it. By properly prostrating before those saints who know the true knowledge and solution of the Supreme God, by serving them, and by giving up deceit, asking questions with simplicity, they, who know the Supreme God in essence i.e. knowledgeable Mahatmas, will instruct you in that Tatvgyan/True spiritual knowledge. Do not have to keep fast of any kind. Do not have to do any pilgrimage, nor have to take any bath in Ganga etc, nor have to go to any other religious place for the sake of bathing or seeing. Do not have to go in any temple or place of pilgrimage of a favoured deity with the feeling of devotion or worship thinking that God is in this temple. God is not an animal whom the priest has tied in the temple. God (is omnipresent) is present in every particle. All these sadhnas (ways of worship) are against the scriptures. Just think a little that all these places of pilgrimage (like, Jagannaath Temple, Badrinaath, Haridwar, Mecca-Medina, Amarnaath, Vaishnodevi, Vrindavan, Mathura, Barsana, Ayodhya Ram Temple, Kashi Dhaam, Chhudani Dhaam etc), temples, mosques, gurudwaras, churchs and places of pilgrimage of favoured deities etc are such places where some saint used to live. They after doing their sadhna1 there and collecting their wealth of bhakti2 , left their bodies and went to the lok of their favoured deity. Thereafter to preserve the evidence of their presence, someone built a temple there, some a mosque, someone a gurudwara, someone church or someone an inn etc, so that their memory remains, and insignificant people like us keep getting the evidence that we should perform actions similar to these great souls. All these religious places only give this message to all of us that just as these famous saints have done sadhna, so should you. For this, you must search for the saints who do and tell sadhna in this very way, and then do as they say. But later people started worshipping these places only, which is absolutely useless and is contrary to the scriptures. All these places are like such a place where a sweet-maker built a bhatti (clay-oven), made sweets like laddu, jalebi etc, and after eating himself and feeding his near and dear ones, went away. Thereafter neither is there any sweet-maker in that place, nor any sweet. Only the bhatti is there then. Neither can it teach us how to make sweets, nor can fill our stomachs. Now, if someone says, "Come, brother! I will show you that bhatti where a sweet-maker had made sweets. Let's go." Went there and saw that bhatti, and also circumambulated it seven times. Did you get the sweet? Did you find the sweet-maker who teaches the method of preparing sweets? For this, you will have to find a similar sweet-maker who first of all feeds you the sweet and then also explains the method of its preparation. Then only do what he says, nothing else. Similarly, instead of worshipping the places of pilgrimage, find the same kind of saints who do and tell bhakti of Supreme God Kabir according to the scriptures. Then only do as they say. Do not act as your heart desires. Translation: - Clever people, through their speeches, instead of guiding the true path of the way of worship of Supreme God (Purna Brahm), in place of nectar, are respectfully making sip pus (from a boil or wound) of the worship of others [like, ghost-worship, Pitraworship, carrying out shraadhs, worship of the three gunas (RajgunBrahma, Satgun-Vishnu, Tamgun-Shankar) and worship of BrahmKaal and way of worship upto temple, mosque, gurudwaras, churchs, places of pilgrimage and keeping fasts]. The supreme-happinessgiving Purna Brahm Great Kabir acquiring another body made up of masses of light (tejpunj1 ) similar to that of Satyalok appears in body in an ordinary attire (vastra) [The meaning of 'vastra' is 'attire' - in saint language, it is also called 'chola'. Like, if a saint gives up his body, then it is said that Mahatma has left his chola], and by spending life like a common man and living in the world for a few days, by describing the true knowledge by means of his hymns-verses, brings awareness about the hidden actual true knowledge and worship of the Purna Parmatma (Supreme God). Translation: He who, abandoning the injunctions of the scriptures, acts according to his whimsical desires, neither attains siddhi1 , nor supreme state, nor happiness. Translation: Oh Arjun, this bhakti is neither successful of a person who eats too much, nor of a person who does not eat at all i.e. keep fasts, nor of a person who sleeps too much, and nor of a person who always keeps awake. Translation: Worshippers of gods go to gods, worshippers of pitras go to pitras, worshippers of ghosts go to ghosts, and those devotees who worship in accordance with the scriptures (matanusar) are benefited by me alone. Therefore, do worship of that Supreme God, from whom you will attain complete salvation. That God is Purna Brahm / SatPurush Sat Kabir (Eternal Kabir) . Its evidence is also in Gita Ji Adhyay no 18 Shlok no. 46. Translation: The God from whom all the living beings have originated and from whom this whole world has pervaded, by worshipping that God through the performance of one's natural activities, a man attains supreme spiritual success. Translation: Oh Descendent of Bharat, Arjun! You, in every respect, go in the refuge of only that Supreme God. By the grace of that Supreme God, you will attain supreme peace and will attain the eternal supreme state. The meaning of 'in every respect' is to not do any other worship and to have faith in only one God by mind-action-speech. Translation: Oh Prthanandan Arjun! The Param Purush Parmatma (Supreme God), under whom are all the living beings and from whom this whole universe has pervaded, is attainable only by undivided devotion. Translation: With the roots above and the branches below, it is an eternal and extensive tree, strong like a horse, whose small- small parts are said to be twigs and leaves. One who knows that tree of world in this manner, that devotee is completely knowledgeable. Translation: That tree's three gunas Rajgun-Brahma, SatgunVishnu, Tamgun-Shiv -like defects - lust, anger, attachment, greed, arrogance - like shoots and branches - Brahma, Vishnu and Shiv, only are the root (main) cause of binding the soul to actions (Karm), and in the world of men - Heaven, Hell and Earth, have been arranged below (in, 84 lakh births of various living beings) and above. Translation: This Creation has neither a beginning nor an end, nor that form is perceived. And here in this discussion i.e. in the knowledge of Gita being imparted by me, even I do not have full information because even I do not know about the proper state of the creation of all brahmands. By slashing with this firm weapon of untainted i.e. pure Tatvgyan which has a properly stabilized state and a strong form, i.e. by considering the bhakti of Niranjan to be short-lived. Translation: After that one should search for that Supreme God with supreme state. Having attained whom, human beings do not return to the world, and from whom this ancient creation -nature/ srishti has extended. I am also in the refuge of that Eternal Supreme God only. Thus, even God Shri Krishna himself, making others relinquish the worship of Indra who is the king of gods-goddesses, had encouraged to do bhakti of only that Supreme God. Because of which raising the Govardhan mountain he had protected the residents of Brij from the anger of Indra. Without the permission of Guruji, do not have to perform any type of religious rite at home. Like, Bandichhor (Liberator from prison) says in his sacred speech - "Guru bin yagya hawan jo karhin, mithya jaave kabahu nahin falhin"
Do not have to worship 'madi' (memorial structure/statue) made in your field or any 'kheda' (a site where a village or city has been destroyed) etc or the grave of any god. Whether grave is of anyone, do not have to worship it at all. Do not have to do any other worship. Even do not have to worship the three gunas (Brahma, Vishnu, and Shiv). Only have to act according to Guruji's instructions. On arrival of any suffering (crisis) as a result of karam (deeds), never have to worship any other deity God or Goddess etc., nor have to go to any palmist/astrologer. Only have to worship God Kabir who removes all the miseries, who is the liberator from crisis. Translation: Primordial i.e. Eternal Supreme God Kabir, by giving instruction of three mantras to a devout soul who loves Him by heart and does worship with faith, by purifying him, releases him from birth and death, and fully increases the countable life-breaths, which have been given to his friend i.e. devotee according to destiny, from His store/treasure. As a result of which, makes him attain the real happiness of Supreme God by His blessings. Do not have to give anything in form of charity anywhere and to anyone. Neither money, nor unstitched cloth etc, nothing. If someone comes asking for any charity then feed him and give something to drink like tea, milk, lassi, water etc, but do not have to give anything else. Who knows that beggar might misuse that money. For instance, a man hearing a false story of a beggar, in which he was telling that his children are suffering without treatment out of emotions, gave him Rs 100. Earlier that beggar used to drink 250 ml of alcohol. That day he drank half a bottle of alcohol and beat his wife. His wife along with his children committed suicide. That charity done by you became the cause of destruction of that family. That is why charity is prohibited. If you want to help such a distressed person, then get his children medication from the doctor but do not give money. Do not have to eat food remnants of such a person who consumes alcohol, meat, tobacco, egg, beer, opium, cannabis etc..
Do not have to go to any place of pilgrimage for getting the child's head shaved off. When you see that the hair have grown, get them cut and throw them away. Saw in a temple that reverential devotees came to get their son's or daughter's head shaven off. The barber over there asked for three times more money than outside, and cutting a scissor full of hair gave them to the parents. They offered them with faith in the temple. The priest put them in a bag. At night, he threw them away in a distant solitary place. All this is just a drama. Why not get head shaven off in a normal manner as before and dispose them outside. God becomes pleased with naam, not by hypocrisy. Naam (updesh/initiation) should not be taken only with a viewpoint to remove sorrows, rather should be taken for self-welfare. Then with sumiran1 all the joys come automatically. Do not criticize your Guru even by mistake, nor hear it. To hear means if someone says false things about your Guru Ji, then you do not have to fight, rather should think that he is speaking without thinking i.e. is telling a lie. Whenever you get time, try to come to satsang and do not come to satsang to put on airs (pride-superiority). Rather come considering yourself ill. Like, an ill person, no matter how wealthy he is, or whatever high designation he has, when he goes to a hospital, at that time his only aim is to become free from the illness. Wherever the doctor says him to lie down, he lies down, wherever the doctor says to sit down, he sits, when directed to go out, goes out. Then when he is called to come in, comes in quietly. If you come in satsang (spiritual discourse) just like this, then you will get the benefit of coming in the satsang; otherwise it is fruitless. In satsang, wherever you get to sit, sit down, whatever you get to eat, considering it as prasaad (gift/blessing) by grace of God Kabir, eat it and remain happy. If an Akhand Paath ( A non-stop reading of a Holy Book) or spiritual discourse is going on somewhere or one has just gone to visit guruji, then first of all, one should (do dandwat pranaam) prostrate in reverence before Guruji, and should later bow before Sat Granth Sahib and the pictures like the idol of God Kabir, the idol of Saint Garibdas Ji and Swami Ramdevanand Ji and of Guru Ji, by which only the devotion is maintained. Do not have to worship the idol. To only bow respectfully before a picture does not come in worship. It only helps in maintaining the devotion of a devotee. Pooja (worship) has to be done only of the living Guru and naam mantra who will convey one across (liberate). If a devotee is hostile towards (turns away from) Guruji, then he incurs heinous sin. If someone does not like the path, he can change his guru. If he becomes hostile towards the former Guru or criticizes him, then he is known as the traitor of Guru. If a disciple holds bhaktidiscussion with such a person, then he is at fault. His bhakti finishes. In other words, a person, who goes to a traitor of a Guru, will become devoid of bhakti and will go to hell and in 84 lakh birth of various living beings. One should never gamble or play cards. We all are children of the same God. When God hasn't discriminated between men and women of different cast and creed, then why should we? Accepting or giving dowry is a social evil and is a cause of unrest among humans. For a disciple, it is prohibited to give or accept dowry. What else is left when a person has already given his daughter, the core of his heart. Important: Women and men both have the right to attain God. Women even during their monthly periods (menses) should not stop their daily worship and lighting lamp etc. Nor have to stop the daily worship on anyone's death or birth. Note: A devotee who will not follow these twenty-one formulated orders, his naam (mantra) will finish. If someone commits any mistake unknowingly, it is forgiven, and if has knowingly committed it, then that devotee becomes devoid of naam. Its only solution is that, ask for forgiveness from Gurudev Ji and again receive naamupdesh (initiation).